Synthesis golf started over summer, and a few nice targets have been used as problems. When we started, the academic year (in the UK at least) hadn't begun, meaning a few of us had a quite a lot to time to spend around here - this has tailed off slightly now term has began so I thought it might be a nice idea to open up the floor to suggestions for targets for future rounds of synthesis golf. Each month, we'll use one of the targets (that hopefully get posted) below. The molecule must be predominantly organic. Small molecules with biological activity have been chosen for all previous rounds of synthesis golf, but there is no strict requirement that the target be biologically active. The molecule must be a published compound. It's fine if there are no published syntheses (for instance newly isolated natural products) but the actual target, along with unambiguous characterisation data must exist. The molecule should be complex enough to require some thought, but not so complicated that it would take a team of 5 PhD students a week to come up with a route. This has been one of the biggest challenges so far in finding targets but as a general rule of thumb, good targets would have 5 or fewer strereocentres that need controlling and somewhere under 15 carbon atoms. 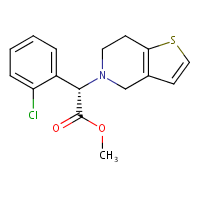 (+)-Clopidogrel (sold as Plavix) is a common pharmaceutical used to help combat the risk of heart disease. The World Health Organisation lists Plavix on its list of 'essential medicines' due to its broad efficacy, low toxicity and low cost (less than 1USD/month in the developing world). 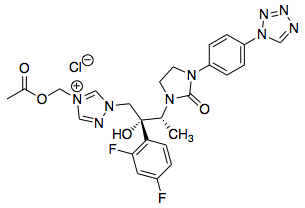 The molecule makes an interesting target as it requires the synthesis of an unusual heterocyclic core, as well as the challenging stereocentre which is prone to racemisation. Given that a racemic synthesis is extremely short (four or five steps, refs 1 and 2) and likely unchallenging, some extra conditions will likely have to be imposed. Firstly, if it isn't already obvious, the synthesis should be asymmetric (13 steps in ref 3). On top of that, my personal suggestion would be that the oxazolinone ring has to be made (since we have already had one round of indole synthesis, I think we can allow the indole to be bought). Dirlam, J. P.; Clark, D. A.; Hecker, S. J. 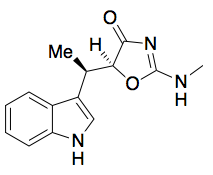 New total synthesis of (±)-indolmycin. J. Org. Chem. 1986, 51 (25), 4920–4924. DOI: 10.1021/jo00375a030. Shue, Y.-K. Total synthesis of (±) indolmycin. Tetrahedron Lett. 1996, 37 (36), 6447–6448. DOI: 10.1016/0040-4039(96)01434-7. Takeda, T.; Mukaiyama, T. Asymmetric total synthesis of indolmycin. Chem. Lett. 1980, 9 (2), 163–166. DOI: 10.1246/cl.1980.163. Kato, K.; Tanaka, S.; Gong, Y.-F.; Katayama, M.; Kimoto, H. Enzymatic resolution of 3-(3-indolyl)butyric acid: a key intermediate for indolmycin synthesis. World J. Microbiol. Biotechnol. 1999, 15 (5), 631–633. DOI: 10.1023/A:1008989800098. Du, Y.-L.; Alkhalaf, L. M.; Ryan, K. S. In vitro reconstitution of indolmycin biosynthesis reveals the molecular basis of oxazolinone assembly. Proc. Natl. Acad. Sci. U. S. A. 2015, 112 (9), 2717–2722. DOI: 10.1073/pnas.1419964112. Bonus points for a synthesis that can be adapted to produce the other three stereoisomers of the drug (bonus bonus points for late stage diversification as opposed to, say, using a different enantiomer of starting material). These stereoisomers were of interest (see ref 2). Ichikawa, T.; Kitazaki, T.; Matsushita, Y.; Yamada, M.; Hayashi, R.; Yamaguchi, M.; Kiyota, Y.; Okonogi, K.; ITOH, K. Optically Active Antifungal Azoles. XII. Synthesis and Antifungal Activity of the Water-Soluble Prodrugs of 1-[(1​R,2​R)-2-(2,4-Difluorophenyl)-2-hydroxy-1-methyl-3-(1​H-1,2,4-triazol-1-yl)propyl]-3-[4-(1​H-1-tetrazolyl)phenyl]-2-imidazolidinone. Chem. Pharm. Bull. 2001, 49 (9), 1102–1109. DOI: 10.1248/cpb.49.1102. Ichikawa, T.; Yamada, M.; Yamaguchi, M.; Kitazaki, T.; Matsushita, Y.; Higashikawa, K.; Itoh, K. Optically Active Antifungal Azoles. XIII. Synthesis of Stereoisomers and Metabolites of 1-[(1​R,2​R)-2-(2,4-difluorophenyl)-2-hydroxy-1-methyl-3-(1​H-1,2,4-triazol-1-yl)propyl]-3-[4-(1​H-1-tetrazolyl)phenyl]-2-imidazolidinone (TAK-456). Chem. Pharm. Bull. 2001, 49 (9), 1110–1119. DOI: 10.1248/cpb.49.1110. Hayashi, R.; Kitamoto, N.; Iizawa, Y.; Ichikawa, T.; Itoh, K.; Kitazaki, T.; Okonogi, K. Efficacy of tak-457, a novel intravenous triazole, against invasive pulmonary aspergillosis in neutropenic mice. Antimicrob. Agents Chemother. 2002, 46 (2), 283–287. DOI: 10.1128/AAC.46.2.283-287.2002. Interest in “Molecular Design Golf”? Why is this question closed as homework? Do we need more options for closure?